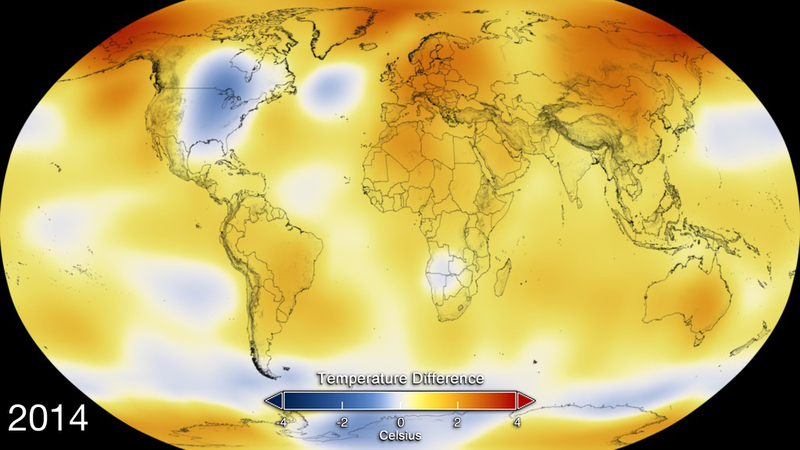 So the real question is just how much of a difference does El Nino make for us? From the plot you can get an idea of the general variability of the different factors as well as how they are affected by El Nino. Looking at the temperature, strong El Ninos are not uniformly all well above average, but it could be said they are all average to above average. 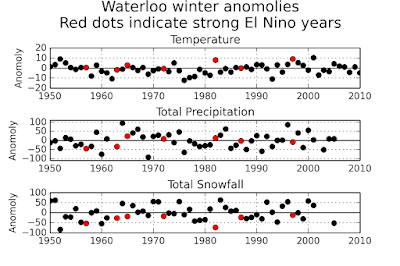 Thus you get the idea that El Nino will encourage warmer winters, but even the strong ones don't guarantee it. Interestingly, for total precipitation it seems that El Ninos tend to not have either very wet or very dry overall winters (keep in mind total precipitation consists of both rainfall and snowfall). Most of the strong El Ninos have resulted in very average overall wetness. 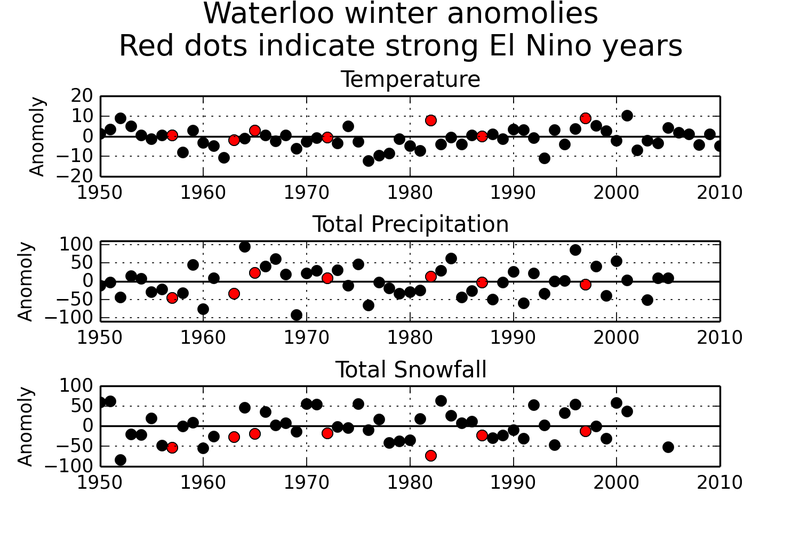 The strongest El Nino effect appears to be in the total snowfall as all the red dots are either a little or a lot below the average line and none are above. 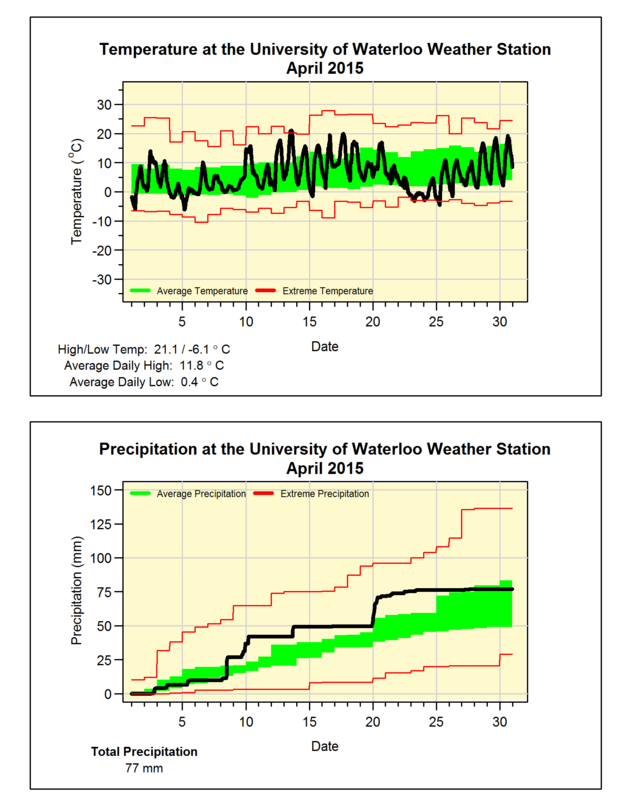 I have never been one who likes to make seasonal weather predictions (you can see why here: http://uwweatherstation.blogspot.ca/2014/12/what-is-winter-going-to-be-like-you.html ) and of course there are no guarantees when it comes to the weather. However, based on the pattern from past strong El Ninos, it would seem that there is a "good chance" that we will see less total snowfall this winter, above average temperatures, and about average total precipitation. But as always, mother nature will have the final say. PS For full disclosure I have to say that I totally stole the idea for the graph from NOAA's ENSO blog, they created a similar graph for different regions of the US, I just adopted it for our region. Although it never really got that hot, there were only a couple of days over 20 C, the overall temperature for the month was almost a degree above average. But incredibly this makes it the coldest October in the last 6 years as in those years it has consistently been more than a degree above average. 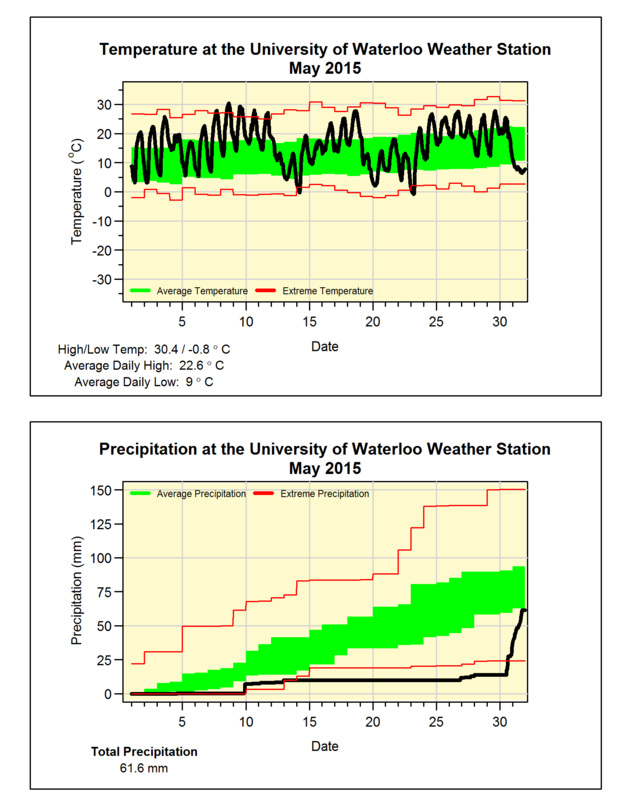 On the graph you can also see when the temperature went up over 15 degrees in just under 6 hours on the 19th. 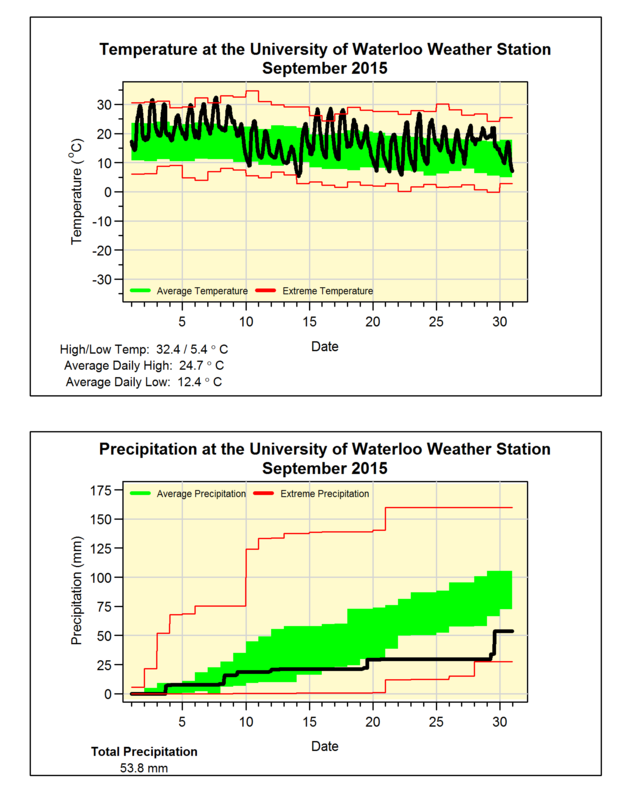 We saw a lot of precipitation late in the month with 30.8 mm on the 28th, however it still would have been an above average month even if that had not have happened. The total of 109.6 mm was well above the average of 67.4 mm. A wetter month puts the total so far this year of 679.8 mm a little closer to the average for the end of October of 750.6 mm. About as average of a month for temperature as you can have with just a few colder and a few warmer than average days. Overall, it was a mere 0.1 degree above average, but this was still the coldest June we have seen in the region since 2009. 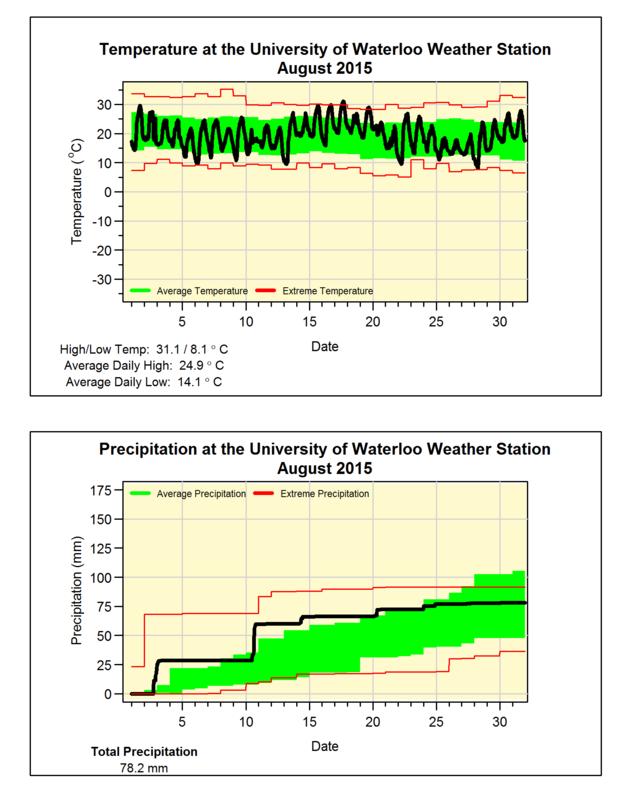 It was a very wet month with 4 days over 15.0 mm along with 18 days of some precipitation compared to the average of 11.5. 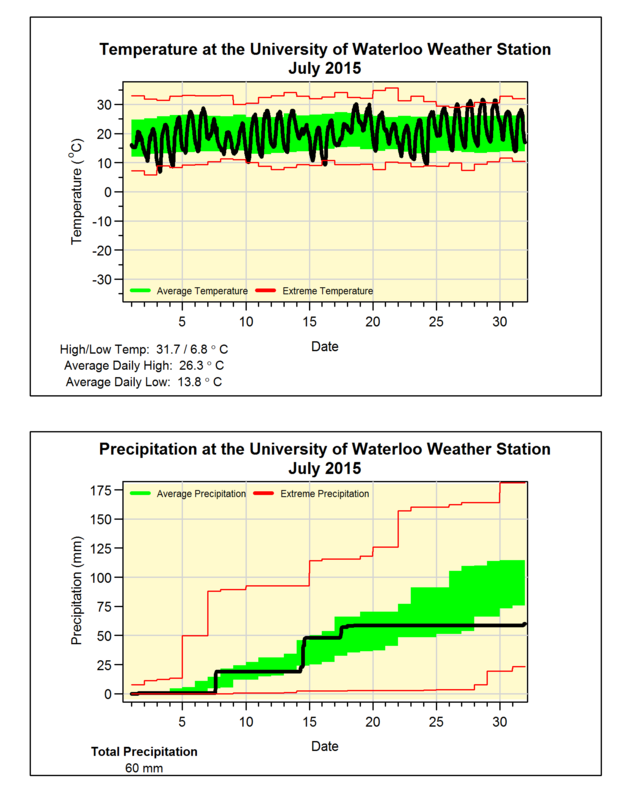 The total of 117.9 mm was much more than the long-term average of 82.4 mm well outside the average range, but we only have to go back to a couple of years to find a wetter month of June. Another interesting thing that I found out was that it is month of extremes, in the last 10 years only once has the total precipitation been in the average range, the rest were either very dry or very wet. This soggy month put the total precipitation we have seen this year (378.2 mm) closer to the average (416.1 mm). Although it went below zero a couple of times during the month, overall it was three and half degrees higher than average making it the warmest May since 1998. This was also the first warmer than average month we have seen this year. Up until the last 2 days of the month it was looking like this May might have been one of the driest every recorded in the region. However, the almost 50 mm in those last 2 days managed to get the total (61.6 mm) just into the bottom end of the average range. The total precipitation for the year so far (260.3 mm) is still considerably less than the average for this time of year (337.7 mm). There were quite a few really warm days during the month, but these were offset by a cold spell during the last half of the month. It was an average month for temperature as the overall temperature was just 0.1 degrees below the average and the first month of the year that wasn’t in the colder than average range. 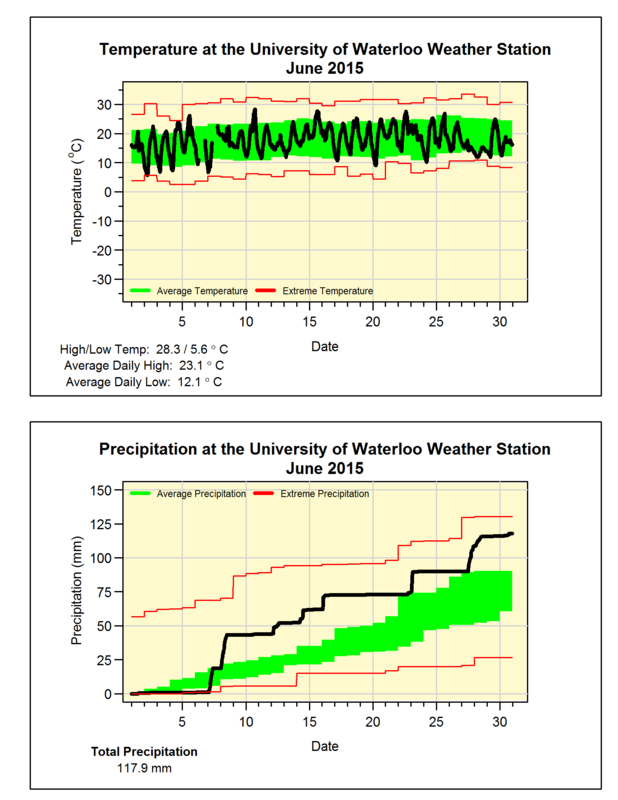 It was also a pretty typical April for precipitation with a just few storms here and there. The 77.0 mm we saw was a bit higher that the average of 74.5 mm, but still within the average range. 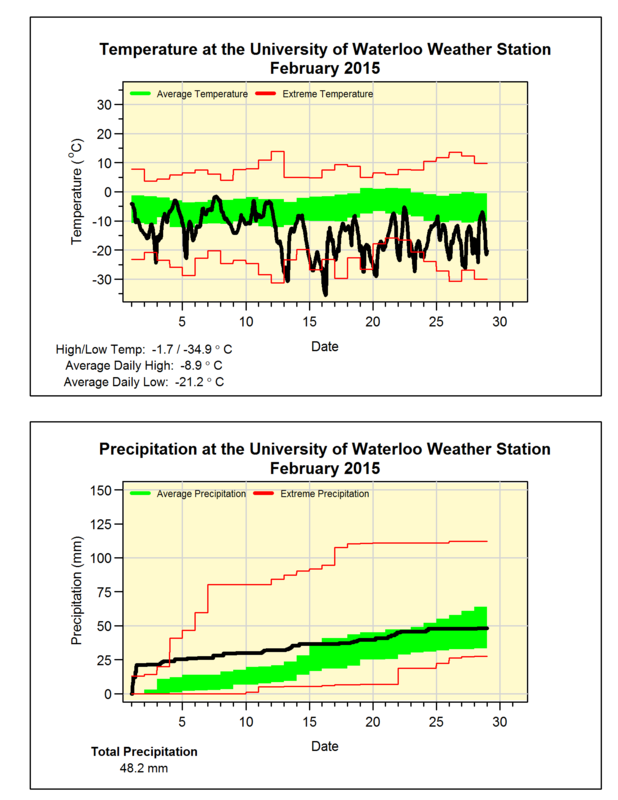 A close to average month for precipitation means that we didn’t really close the gap between what we have seen so far this year (198.7 mm) and that we would expect at this point in the year (264.4 mm). I’m hoping it is now safe to call an end to the 2014-15 snowfall season, with April adding 3 cm, the total for the season was 127.5 cm. This is a lot less than the average of 159.7 cm and the lowest total since 2011-12. I would like to thank our snow measurement volunteers Melinda, Eric, Stephen, and Dave. Not only was it the coldest February in the 100 years of weather records in the region, but it was also the coldest of any month. The average temperature was -15.1°C, putting it well below the previous coldest months which were February 1934 (-13.3°C) and January 1994 (-13.2°C). Even though last year seemed really cold at the time, at an average of -11.6°C, it was practically balmy compared to this year. Overall, it was over 9 degrees below average with many of the daily high temperatures not even getting up to the average low temperatures for that day. Also of note was the low temperature we saw on Family Day (Feb 16) which was -34.9°C, beating the previous low of -32.3°C on January 27, 2005. 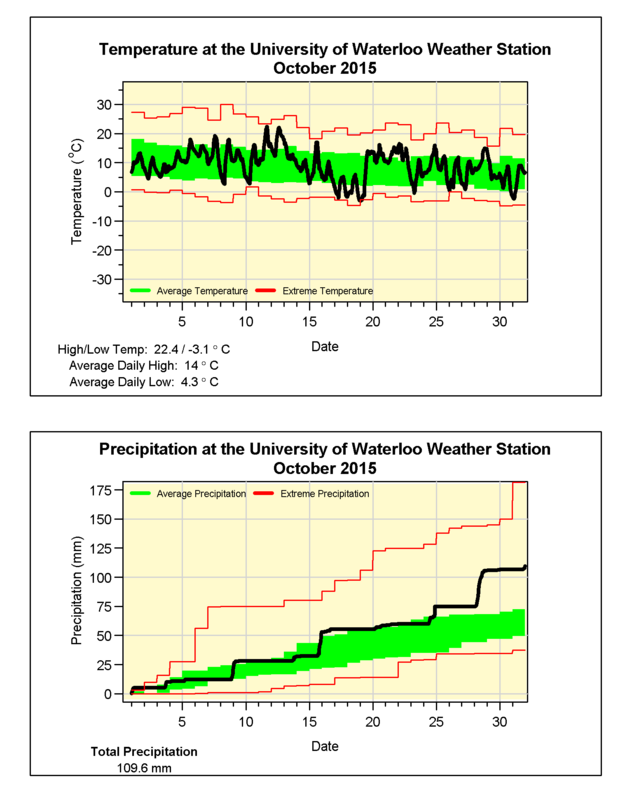 The precipitation got off to a fast start for the month but ended in the average range with 48.2 mm (note that because the solid precipitation gauge at the UW weather station was not working this is based on the Environment Canada station called ”Waterloo Wellington 2”). The snowfall we received of 54 cm was well above the average of 30.3 cm for the month. With only a few scattered days that were above average, it is not that surprising that the month was very cold (overall 3 degrees below average). However, it might be surprising that it was not that much colder than last year’s (much hyped) January. Although it was February and March that really made last winter stand out, so we still have a long way to go to match it. 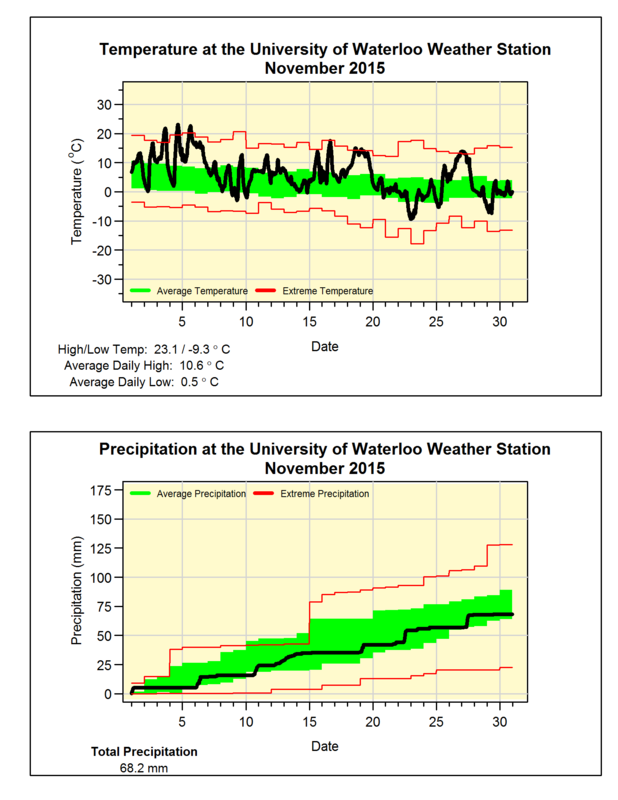 After a wet start to the month, the rest was pretty dry, causing us to end within the average range. As far as snow, the 34 cm that came down was below the average of 43.7 cm. 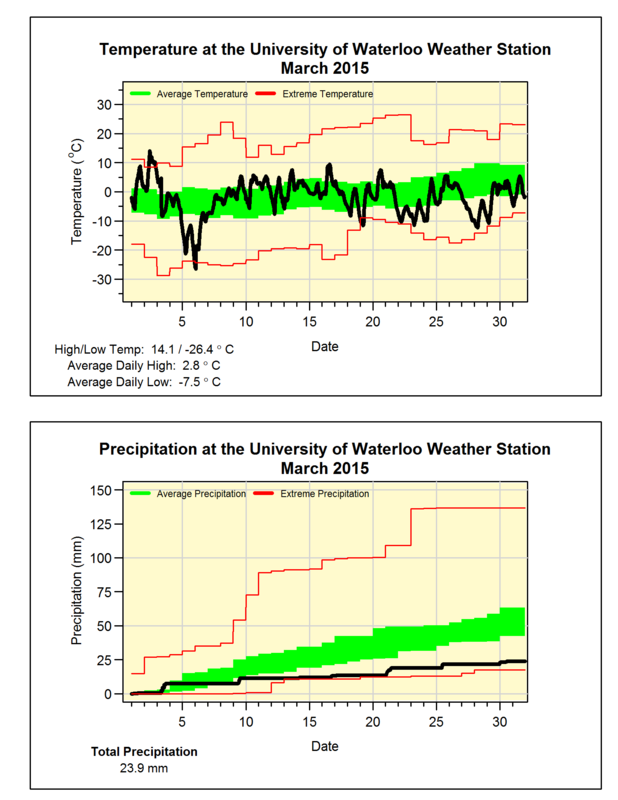 As well, a bit of milestone here as this month marks the 10th year that I have been doing these weather station summaries (and if you didn’t know, you can see all ten years of the summaries on the UW weather station website here: http://www.weather.uwaterloo.ca/data.html#chart ).